I failed in Manchester- then I moved to Sevenoaks and met Simon !! 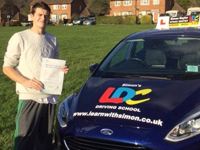 Simon is a fantastic instructor, he made me feel calm and comfortable throughout. I now feel that I am a safe and confident driver. 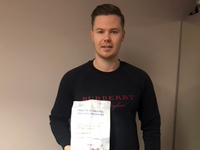 With his maximum effort and detailed lessons, he made the process feel easy, with noticeable improvements every time, whilst giving me something to think about to improve my driving in-between lessons. Simon is very easy to get along with and I enjoyed every lesson I had with him. 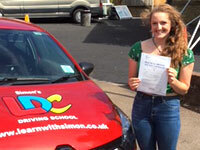 If anyone wants a patient and understanding driving instructor then I would highly recommend Simon! Also, as it's unlikely that you will ever forget who your driving instructor was, better make sure it's Simon! Thanks again! I passed first time with only one minor!! I was so pleased to pass 1st time !!! 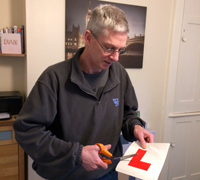 Simon has been a great driving instructor. He has been understanding & patient throughout. 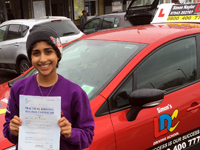 I passed 1st time and I have been very happy with the experience. I would recommend Simon to anyone. He has a pleasant, faier & calm attitude. Each week we built upon the skills learnt from each lesson. Every week I grew in confidence because of Simon being so thorough. I would like to thank Simon. A wholly positive experience !!! My experience with Simon has been wholly positive. He is a thorough, patient instructor who knows the techniques required for each of the manoeuvres. I found that with him I was able to learn from my mistakes well and I can safely say that I feel like a confident and safe driver thanks to him. I passed - and I am from Romania !! Simon was the best instructor you could ask for. My older brother had difficulty finding a good instructor and I had a couple of lessons with another one previously and can confidently say Simon is the best. He was diligent in making sure I knew everything I had to for my test and supported me throughout my learning. He gave me confidence that other drivers lack, and we had a good laugh every lesson. 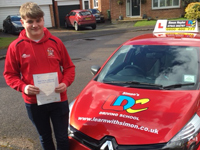 Learning with Simon is so rewarding in that you looked forward to lessons whilst becoming a superb driver. I couldn't thank him enough. I finally have freedom and my parents can rest assured that I'll be safe. Recommending to everyone in the area - thank you Simon!! 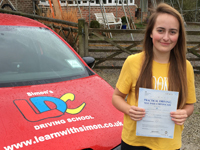 Izzy ......................Dear Simon, just wanted to say a massive thank you for teaching Izzy to drive. 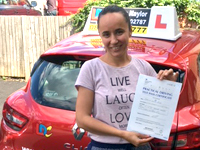 She has enjoyed every single lesson and is delighted to have passed first time. I shall have no hesitation in recommending you to others. Thanks again. Jenny (mother). I failed with one company but passed with LDC !! 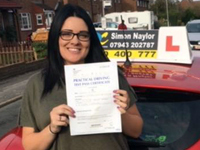 Simon is a fantastic driving instructor; changing driving instructors to learn with him was a great decision. 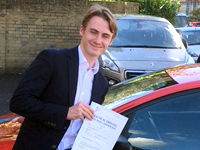 He is a very calm, encouraging person to sit by your side as you learn to drive – I genuinely looked forward to my driving lessons! He enabled me to pass my test so that I can confidently say that I am a safe driver. I would highly recommend him. I could drive in New Zealand but not in the UK !! 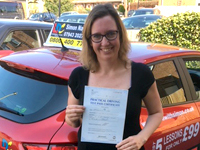 My situation was slightly unusual as I needed to resit my driving test twenty years after I did it the first time, as I had moved to the UK from New Zealand. I hadn’t driven in fifteen years and felt very nervous about it. 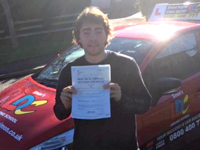 Simon was fantastic, he took things at exactly the right pace so that I built up my confidence but progressed quickly. I really enjoyed our lessons as Simon was always very patient and calm. 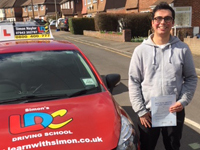 I passed my test the first time and definitely couldn’t have done that without Simon’s help. I would recommend Simon to anyone! I have told all my friends !! Passed 1st time and all before my 18th birthday !! I conquered my nerves to pass 1st time !! Simon's relaxed and patient way of teaching made learning with him a fun experience. He took the time to make sure I did everything I needed to do pass first time. The structured approach to the lessons made it easy to know what to expect from each session, and built upon previously learnt skills, which gave me confidence in my own ability, that was needed to succeed in the test. Thank you. Happy to pass on my first attempt !! On going lessons progressing very well !! Passed 1st time and only 1 minor!! Simon is a brilliant instructor. He has lots of patience in what he does; I was very nervous as I moved from my previous instructor to Simon, as my previous instructor used to shout at anything I did wrong, but Simon is different. He turns a negative into a positive, and gets you driving the way you should be driving, giving 100% effort into you no matter the circumstances. 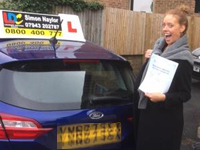 I would rate Simon a 10/10 and would definitely recommend him .............and by the way passed first time with 1 minor. Thanks again Simon. My wife had the challenge of finding me a flexible instructor since my work hours are so unpredictable. Having been turned down by two instructors she was quite disillusioned and consequently lessons were on hold for months until it became urgent to get my licence. Simon was immediately helpful, flexible and obliging with my needs. He was very kind, patient, thorough, encouraging and instilled confidence, which was much appreciated, He greatly helped me to pass my test first time around! I thoroughly recommend him. 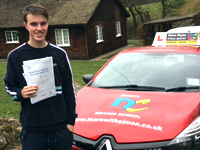 Thank you so much Simon, we couldn't have chosen a better instructor.